Crews placing booms on the Plumbrook Drain in Sterling Heights on Thursday afternoon, to contain a pollutant, believed to be hydraulic fluid, in the drain. 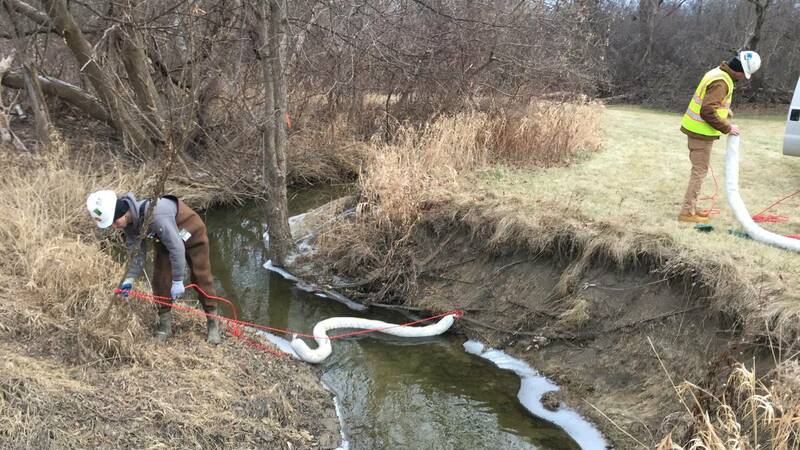 STERLING HEIGHTS, Mich. - A spill of hydraulic fluid into the Plumbrook drain in Sterling Heights has been contained and is in the process of being cleaned up and removed. A crew from the Macomb County Public Works Office is on the scene Friday as part of the cleanup effort. Crews placed eight absorbent booms in the drain, just south of where the drain crosses 19 Mile Road, west of Ryan Road. The sheen was initially reported by a person who was working in the area who contacted the public works office. The sheen may have come from a piece of machinery being used by the Sterling Heights Department of Public Works in the area. The Sterling Heights Fire Department and other city agencies have been assisting in the response. The spilled substance is believed to have been contained in the Plumbrook between 19 Mile and 18 ½ Mile roads. The booms will be checked daily until all trace of the spill has been absorbed, which will likely take about a week. The Plumbrook is one of the larger county drains overseen by the Macomb County Public Works Office, running more or less diagonally from the northwest corner of Sterling Heights until it connects with the Red Run Drain near Freedom Hill County Park. The MCPWO maintains a 24-hour pollution hotline that can be reached at 877-679-4337.